If you are planning on taking the time to explore options that protect your family in the event of sickness or death we can help. Our approach is to understand your areas of financial concern and provide variety of planning and product solutions to help you manage your risk. 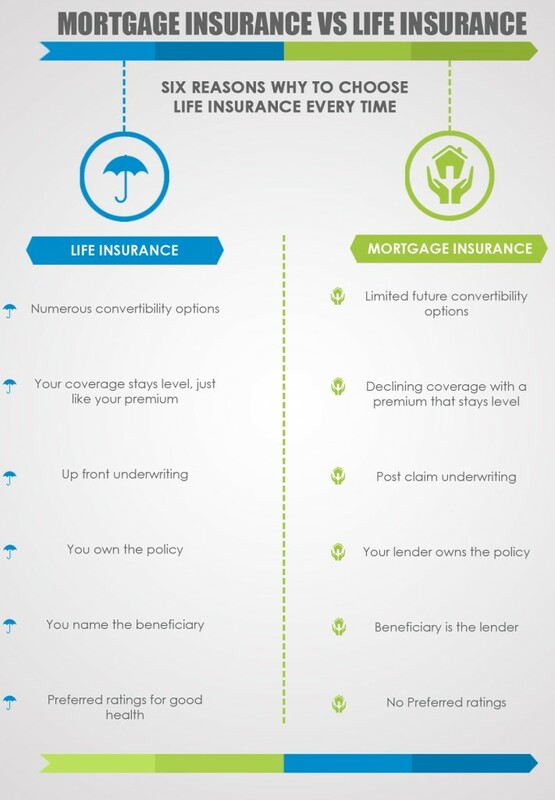 There are some key differences to be aware of when comparing “Mortgage Protection” offered by financial institutions and mortgage brokers and “Mortgage Insurance” offered by licensed insurance professionals (please see illustration below). Understanding the fine print ahead of time on your insurance contract(s) will lighten your stress load in the event of a claim. Term life insurance provides temporary protection for temporary needs. It also has some flexibility, so you can adjust your insurance as your needs change and convert your coverage to a different type of policy. A term life insurance policy will provide you with guaranteed rates and coverage for a selected period of time, most commonly every 10 or 20 years (known as Term 10 or Term 20) although terms of 5, 25, 30 and 35 years are available on today’s market. Statistics show that one out of three Canadians will experience a serious illness or disease in their lifetime. Although many people will survive a critical illness, the recovery period can severely drain your financial resources. A critical illness policy will provide you with the financial support you need while you recover. We have the experience to provide you with numerous options from stable carriers to fit all budgets and needs.